Celebrating its 32nd year, the 2018 Multifaith Calendar's theme is "The Power of Inspiration." This year's theme invites us to look at the sources of inspiration - from our faith, from listening to music, or discovering a new skill or talent. We all need inspirtation to get us through the times that are dark. Like a light piercing through the darkness, inspiration can lift us up when we feel we can't go on. It is as needed as the air we breathe. This 36 page calendar includes an introduction to the theme, 370 + accurate dates and meaning of significant religious and holy days plus many global cultural festivals, essays on the uses of calendars with lunar cycles and concise information about 14 religions present in North America. The MFC also includes a stunning array of original art from visual artists across North America and Internationally. 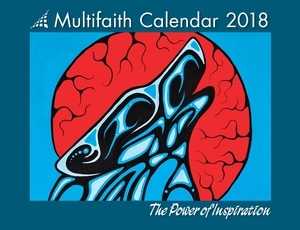 The Multifaith Calendar is a resource tool for fundraising, faith leaders, educators, corporate managers, home family rituals and popular as a holiday gifts! It stimulates dialogue and discussion for interfaith gatherings and supports management in honoring special celebration days of fellow workers. The 2018 Multifaith Calendar measures 9.5" x 12.25" and makes a handy reference piece for the home or office. To see a sample page and the back cover collage of monthly images, click on the "view larger" icon below the main MFC image on this page.